There's one thing that I've been consistently passionate about for the last eight years...strengths. In fact, I started becoming obsessed with strengths-based development in 2009 after reading Now, Discover Your Strengths in my MBA program. So, it was only fitting when Western Michigan University (my MBA alma mater) reached out to me to be featured in their 2013 WMU Haworth College of Business annual magazine—I just had to say yes. 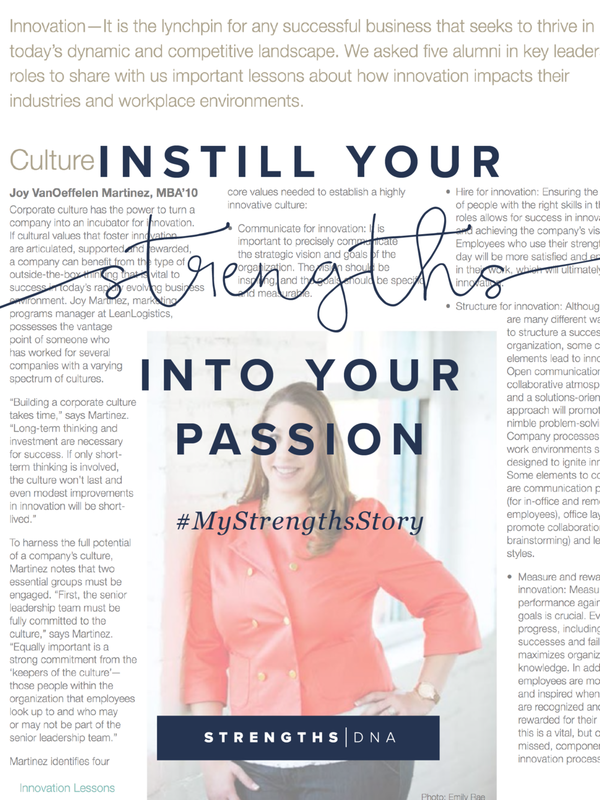 The issue was centered around innovation, and I knew just what I wanted to write about: corporate culture and strengths. You see, when I was earning my MBA, I worked for a company that had a very toxic work environment. Sure, it had its plus sides (including being a coach for members in a $50k/year mastermind program—more on that some other time), but mostly I learned a lot of what not to do. Which, by the way, is just as powerful to learn from! Meanwhile, I'd go to my Organizational Behavior class at night and had my mind blown! I couldn't believe how awesome some companies culture was and how it impacted employee engagement and morale, productivity, and profitability. I knew from that second on that I needed to find a company like that to work for. And it made for a great topic for this magazine article on how culture drives innovation for the organization. So, I got published for my very first time! This quote is true for entrepreneurs too—the more you can use your strengths every day, the more satisfied and engaged you'll be with your work! The biggest lesson from this, though? I've been asked the question, "If I have these strengths (fill in the blank), what careers will I be good at?" or "If I don't have these strengths, does that mean I won't be a successful entrepreneur?" The answer? It doesn't matter. It doesn't matter one single bit what strengths you have. Your strengths do not determine what you will be good or not good at. The thing you'll be most successful at is something that you are so uber-passionate about, you could do it forever, for free, in your sleep...because you love it that much. And THEN, take your natural talents and put investment into those talents in order to turn them into strengths so they can benefit your passion (especially if you're monetizing this passion as a business), and it doesn't hurt to mix in some hard work. Your strengths enhance what you're capable of. They don't determine what you're capable of. Working in your strengths helps you to be your best self, to reach your fullest potential, and to perform at a high level. My 8-year passion of strengths has not diminished over the years; in fact, I've only grown more and more passionate as the years have gone on. I put investment into my talents - time and energy putting my own talents to work, gaining skills and knowledge around those talents - so that I can turn them into strengths and instill those into my passion, which is my business today. And while I've only been in business since February 2016, it feels like I've been at my business even longer when I consider the eight years of investment and passion for strengths-based development that I have had. Eight years of instilling my strengths into my passion, and finally monetizing it in early 2016 and officially forming my LLC and taking on clients. (Note: This WMU article was written in 2013...that's three years before I finally started my business! See, I wasn't kidding when I said I've been passionate about this for a long time. And that's how I knew it was the right business for me. It wasn't a fly by the seat of my pants idea I had. It was a then 7-year passion coming to life). So, instead of thinking that you can't do something because you don't think you have the *right* strengths for it, ask yourself: "What strengths do I have that I can instill into my business and passion to make this successful?" and "What areas do I think I need to find support in so that they don't get in my way of achieving greatness?" What's up with this #MyStrengthsStory hashtag? Read all about it here.